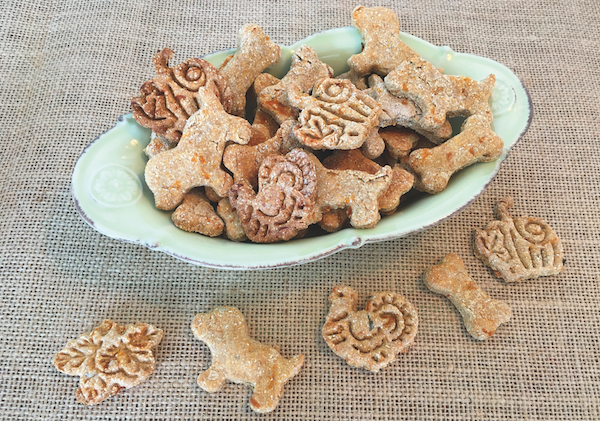 Jeffrey Welch's Blog: Make These Sweet Tater Biscuits for Your Dog! Get your dog in the fall spirit with these yummy biscuits! In a large bowl, mix together sweet potatoes and broth. Add flour, cornmeal, and mint, and stir until combined. Knead the dough until it holds together. Roll out half of the dough on a generously floured surface until about 1⁄4-inch thick. Use cookie cutters to cut shapes of pumpkins, leaves, or dog bones. Transfer to baking sheets; reroll and cut the remaining dough. Bake until dried and slightly golden on the bottoms, 35 to 40 minutes. Cool for 1 hour. Store in an airtight container up to 1 week. Note from Dogster magazine editor Melissa L. Kauffman: Really mash the sweet potatoes, so lumps don’t end up in your dough. I dipped my fingertips in water to add moisture when kneading the dough as it is quite crumbly at first. Also, my biscuits were done at the 30-minute mark; those I left in longer got a little crispy. The post Make These Sweet Tater Biscuits for Your Dog! appeared first on Dogster.